Batman is the animated series from the house of DC Comics. The big name Warner Bros. was the producer of the show and this show started in 1992 and went on till 1995. Not only the animated series, but the film based on Batman is also popular. So, here we are explaining Batman Drawing steps. Through this, you can draw batman cartoon with mask, face and full body using pencil. 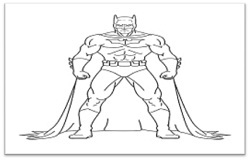 The complete step by step Drawing of Batman cartoon is given below. Though superheroes are generally meant for the children, but batman is more for the adults with the subject line more complex than just good winning over the evils. We already drawn Chota Bheem cartoon but it is time to draw Batman cartoon. Now if you want to get started with the drawing of Batman cartoon, then you will have to start with a light pencil and then at the end you can use dark pencil for final strokes. He wears a mask which covers his head and eyes with cut outs for his eyes and also has pointy tops on his head. Follow for Facial features like eyes, nose and smile. Draw eyebrows and eyes, draw two oval shapes as depicted below. No need to draw his hairline because he wears a mask which covers his ears and head completely. Just follow below for complete face of Batman. For his chest draw a big circle, and for arm, draw two big circles just below the chin and on either side of the circles, draw two oval shapes and intertwined for more circles and ovals as depicted below. Now draw the outline for the tummy as depicted below. Draw Underwear and oval shapes to provide the outline for the legs. Draw Bat on the chest and represents abs. For the abs, you have to draw curves with line through it on the tummy. Trace the basic shapes you have drawn for the tummy. Draw Belt for batman as depicted below. These are the steps to draw full body batman with pencil drawing. I hope above article on “ How to draw batman cartoon step by step” would help you. Keep Drawing using our Drawing tutorials.